Reading manuals and experimenting with software is fine to learn the software, but ACARS and CPDLC are for the most part operational instruments. Learning how to be part of a well-greased organisation is better done by examples and practice. I can attest that it is very rewarding to eventually have a small role in a smooth operation that runs like clockwork. When your team mates can rely on you, and you can rely on them, it makes for a much better experience, and therefore a much better World Flight. This transcript example assumes that you have the technical elements of ACARS and CPDLC set up properly: the software is installed and works, and you have put in your personal logon code (this is not a call sign, but a cryptic key phrase entered in the Setup of the program you use). 22:05Z The crew of flight BAW744 from Sydney to Darwin enters the flight deck and begins their preparations. 22:12Z As part of the avionics setup, the F/O selects ACARS mode on the MCDU (FMC COMM key) and enters basic flight details of the flight: flight number (ATC call sign); departure, arrival, and primary alternate airports; planned departure time; and ETA. 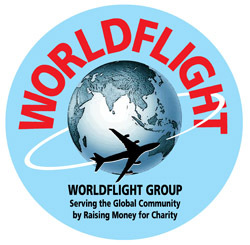 The company for World Flight is standard, 'WFD' (World Flight Dispatch). As a routine check, the F/O goes via ACARS INDEX to LINK STATUS to see whether everything is OK with the communications. It is. He leaves the center MCDU on ACARS PREFLIGHT. 22:35Z While awaiting the boarding to finish, the flight crew loads the route in the FMS via ACARS. Their Dispatch Office has prepared it for them, including a one-off modification just for today's flight, which their on-board company route database does not contain. Note: this function is only available on PS1 flight simulators. 22:37Z ACARS spits out the pre-departure clearance. There is no need to reply, as the system either delivers it all correctly, or not at all. ATC assumes that the clearance was delivered unless it is requested by voice at the appropriate time. The F/O checks the clearance and reports to the Captain. There is no need to adjust the departure plans, the clearance is as briefed. 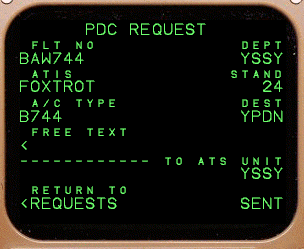 Usually, the assigned squawk code functions as the confirmation that you have received the PDC. It depends on the circumstances whether ATC asks you to read back the squawk, or just checks its presence on your transponder. Don't overlook the fact that your clearance may span more than one page! In this example, there are two clearance pages. 22:40Z Earlier than expected, the loading is finished and Load Planning sends the final load sheet to the ACARS printer. While the F/O adjusts some minor details in the FMS, the Captain contacts Ground and requests startup clearance. 22:52Z ACARS sends the first of a series of progress reports to the WFD dispatch office, signalling that BAW744 left the gate for Darwin. 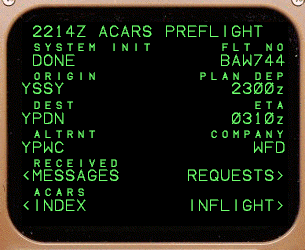 The system automatically advances the ACARS page to INFLIGHT. 23:05Z Crossing FL100, the crew receives the voice ATC instruction Contact Sydney Center on CPDLC, Yankee Sierra Sierra Yankee. The Captain pushes the ATC key on the center MCDU and logs on to YSSY. After half a minute, YSSY Center responds and accepts the logon. 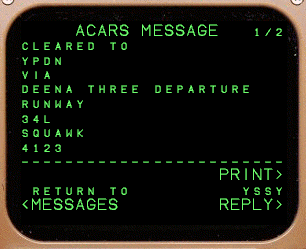 From now on, voice communications are replaced by CPDLC messages via ACARS. However, the crew still monitors the frequency, on the cockpit speakers in the background. 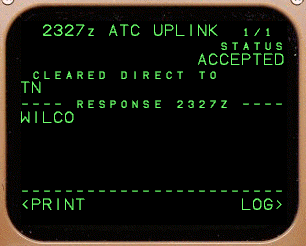 23:22Z The ACARS UPLINK message appears on the MCDU. The Captain pushes FMC COMM to read an incoming company message announcing that all World Flight aircraft are now airborne. 23:27Z With ATC UPLINK the CPDLC system calls for attention. A push on ATC reveals a shortcut offer: CLEARED DIRECT TO TN. The crew accepts this shortcut and adjusts the route accordingly. 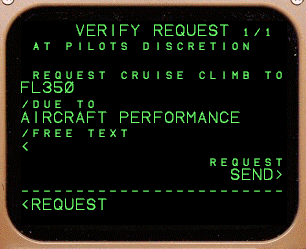 23:56 The crew requests a cruise (step) climb via CPDLC: AT PILOTS DISCRETION REQUEST CRUISE CLIMB TO FL350 DUE TO AIRCRAFT PERFORMANCE. Within a minute, ATC responds by CLIMB AND MAINTAIN FL350, to which the crew responds WILCO. 01:23Z Unnoticed by the crew, YSSY hands off the aircraft to YBBN. Only a peek at the ATC LOGON/STATUS page will reveal the new active center to the pilots. 01:34Z Another CPDLC instruction: REPORT PASSING TN. Apparently the radar facilities aren't up to this. The F/O makes a note on the FMS using a FIX and returns just ROGER to affirm that he will report the passing of TN. 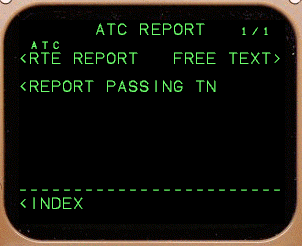 01:52Z Using the ATC REPORT page, the event of passing TN is relayed to ATC. ATC does not acknowledge the reception of the report, as the CPDLC system itself assures delivery. If it fails to deliver, it will tell the pilot and offer to resend the report. 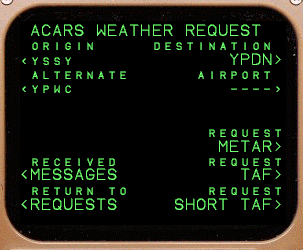 02:22Z The crew uses ACARS to request up to date weather reports for Darwin and a few other fields. They also poll their dispatch office for arrival information, such as the planned stand at Darwin. ACARS comes back with Darwin weather: YPDN 050203Z 00000KT 9999 FEW015 26/23 Q1011. For good measure, the Terminal Aerodrome Forecast is added: TAF YPDN 050200Z 050400 12008KT 9999 SCT040. 02:30Z CPDLC announces CONTACT DARWIN ON 121.65 as the airplane approaches a busy descent area. After establishing voice communications, CPDLC is terminated by the center, which is announced by a MCDU message. 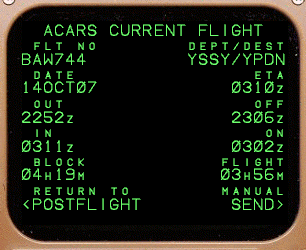 02:41Z As the plane comes out of cruise altitude, the ACARS system starts updating the Dispatch office with new ETAs and other changing details of the arrival, so that appropriate preparations can be made. 03:02Z On touchdown, the ACARS report is automatically sent to Dispatch and the next crew heads for the gate. When the plane comes to a final stop, the whole report is sent out, and the printer produces the flight strip for the paperwork to be returned to Dispatch. The Captain signs it off, securing the crew's pay for today. 03:14Z As part of the 'leaving cockpit' procedure, the F/O initialises the ACARS system by selecting the ACARS PREFLIGHT page and pushing INIT (LSK1L) twice. This wipes all memory and provides the next crew with a clean sheet. After a few minutes like this (without a call sign), the ground system flushes as well and everything is ready for the next flight.